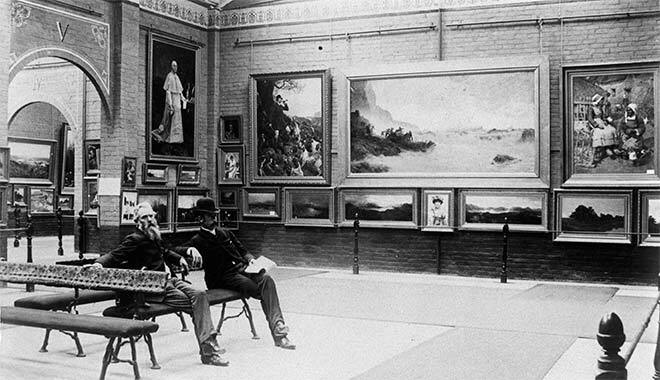 The art display was a highlight of the 1889–90 New Zealand and South Seas Exhibition in Dunedin. There were six galleries displaying around 1,500 artworks. Some were by local artists, but most came from overseas – from Australia and the United Kingdom in particular. This photograph shows part of the British display, featuring (on the far right) an 1883 oil painting by Stanhope Forbes, 'Preparations for the market, Quimperlé, Brittany'. That painting was one of four purchased to form the basis of the new Dunedin Public Art Gallery, which was established in one part of the exhibition buildings after the fair was over.